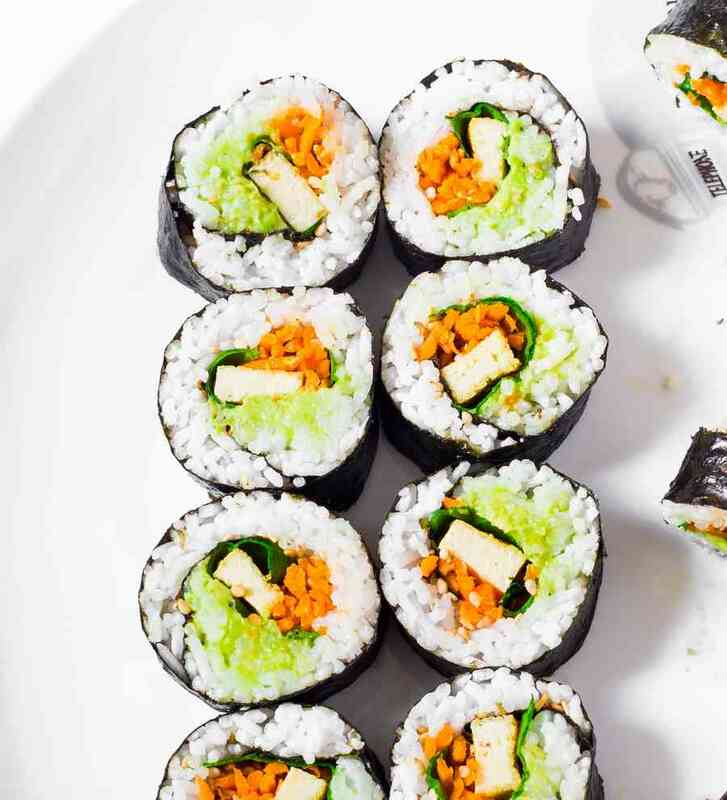 Easy Vegan Sushi Rolls : a very easy and healthy recipe for lunch or dinner. 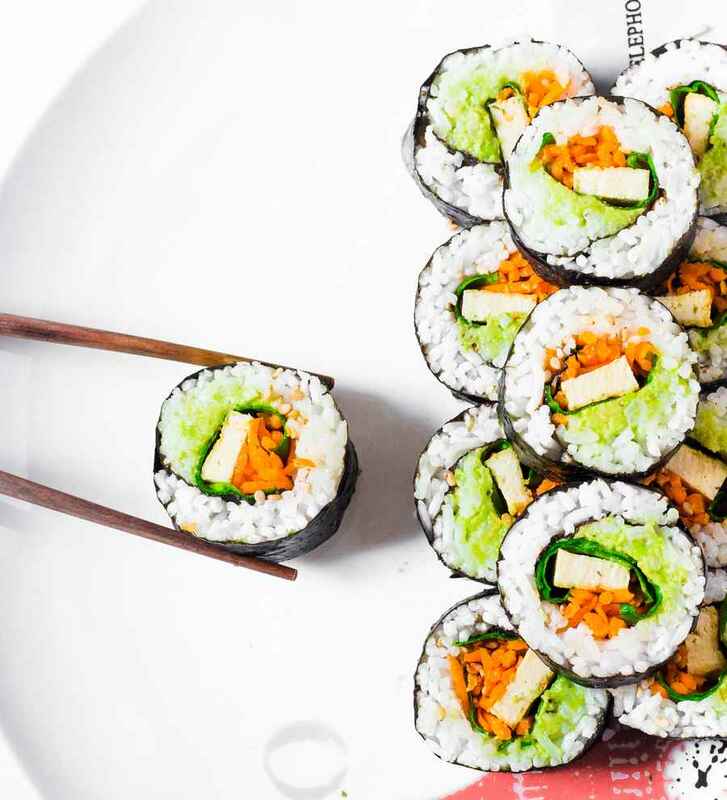 These sushi rolls only take 25 minutes to prepare and are filled with colorful vegetables. 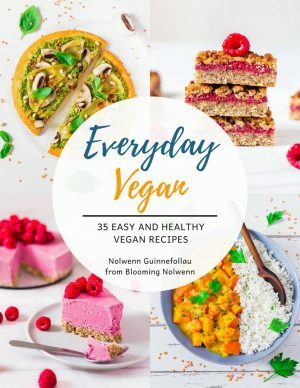 Gluten-free, oil-free and delicious! 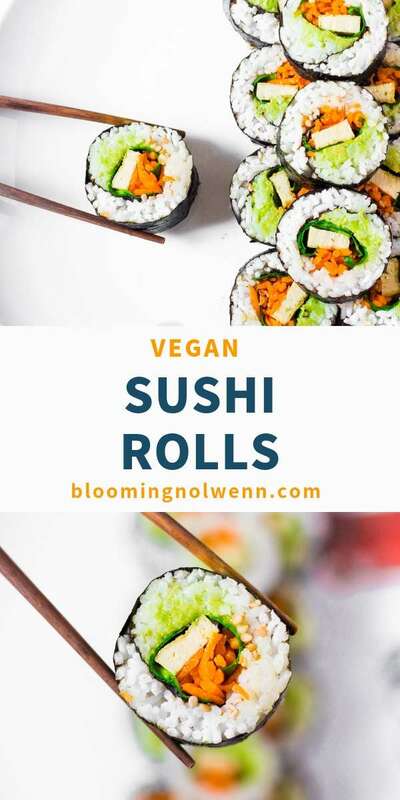 I first made my own vegan sushi rolls five years ago when I was in college, thanks to Tanith’s recipe. Before I found her recipe, I didn’t even know it was possible to make homemade sushi rolls haha! I remember loving her recipe so much that I would make it several times a week. 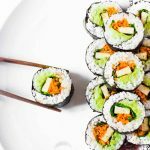 So today I’m sharing with you my own version of vegan sushi rolls because it IS actually very easy to make them yourself! I love sushi rolls because they are very versatile. You can fill them with whatever you want depending on what you have at home or what you feel like eating today. I filled mine with homemade guacamole, grated carrots, spinach and flavored tofu but feel free to use what you already have at home. I recommend that you spread some sort of thick sauce inside the rolls because it makes a big difference in my opinion. Here I used guacamole but you could use vegan cream cheese, hummus or tahini for example. You don’t necessarily need a rolling mat to make sushi rolls. I’ve personally never used one and I think it’s very easy to make sushi without it. All you have to do is spread a thin layer of rice all over the nori sheet, leaving an empty space at the top of the nori so it can close easily. 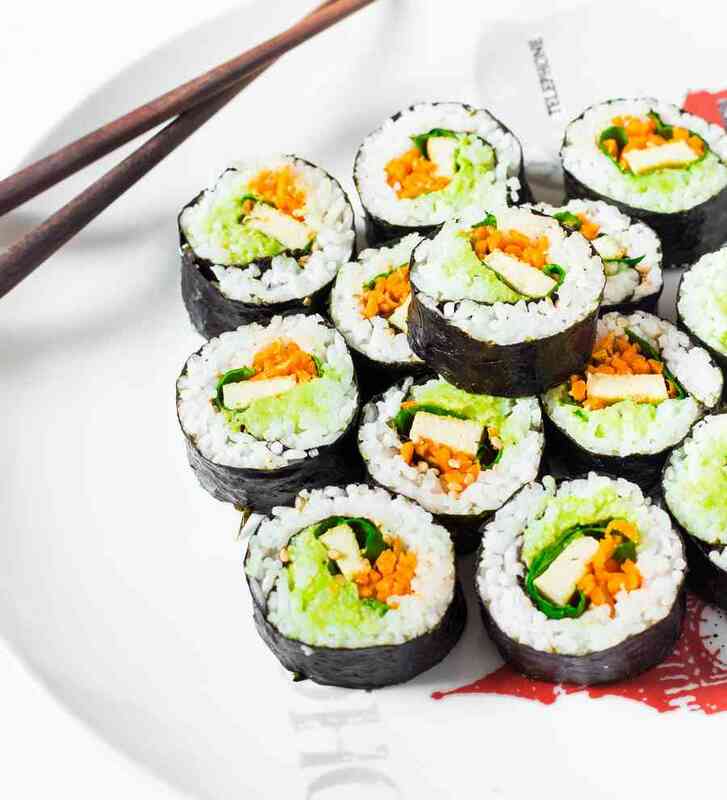 Don’t put too much rice because it could cause the nori to break and make the rolling process a little chaotic. 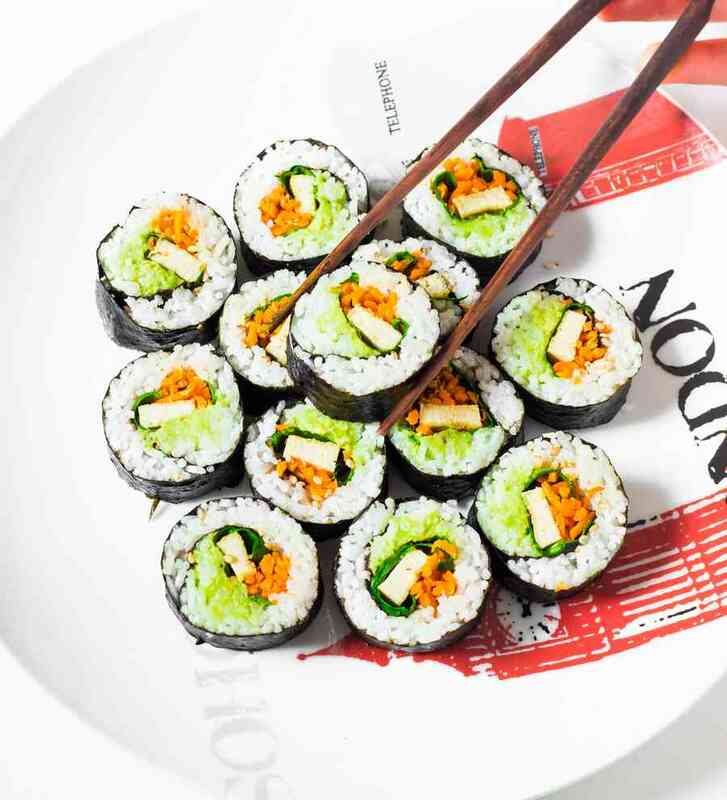 Then, place your sauce and your veggies in a line and roll the nori using your fingers to push the veggies inside the roll. Here I like to place my rolls in the fridge for 10 minutes so they are easier to slice. To slice your rolls, dip the blade of a sharp knife in cool water so it doesn’t stick to the nori. Slice each roll into 8 maki pieces. I like to serve my sushi rolls cold with soy sauce. Mash avocado with a fork and combine with lemon juice. Taste and add salt and pepper if you want. Cook rice as per the instructions on the package. Place one nori sheet on a flat plate with the shiny side down. Wet your fingers to prevent the rice from sticking to them and spread a thin layer of rice all over the nori sheet. Leave about 1 inch (2.5 cm) of empty space at the top of the nori so it can close easily. Spoon some guacamole in a line across the portion of rice closest to you and place the veggies of top (refer to photos). Sprinkle sesame seeds. 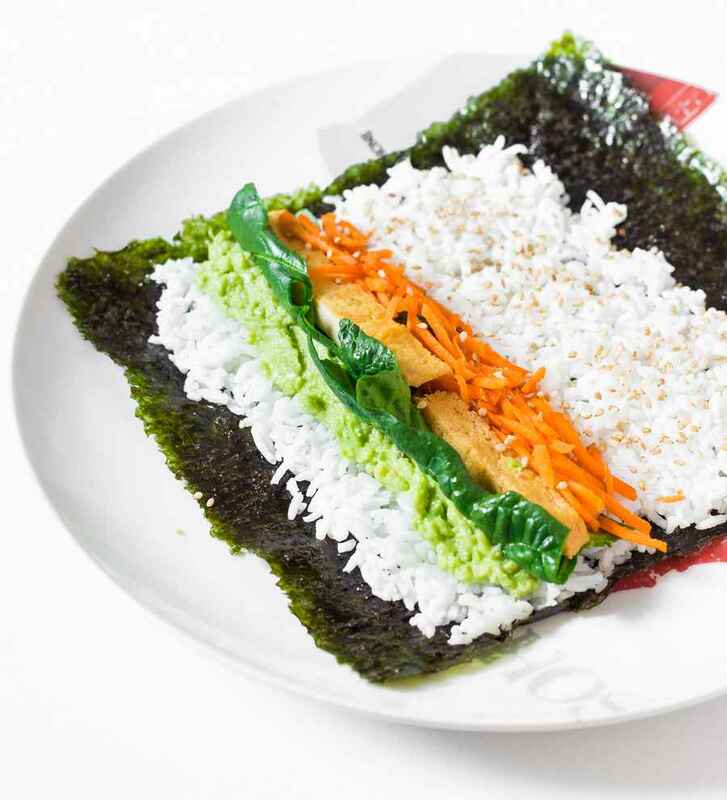 Slide your thumbs under the nori and roll the nori over the veggies. 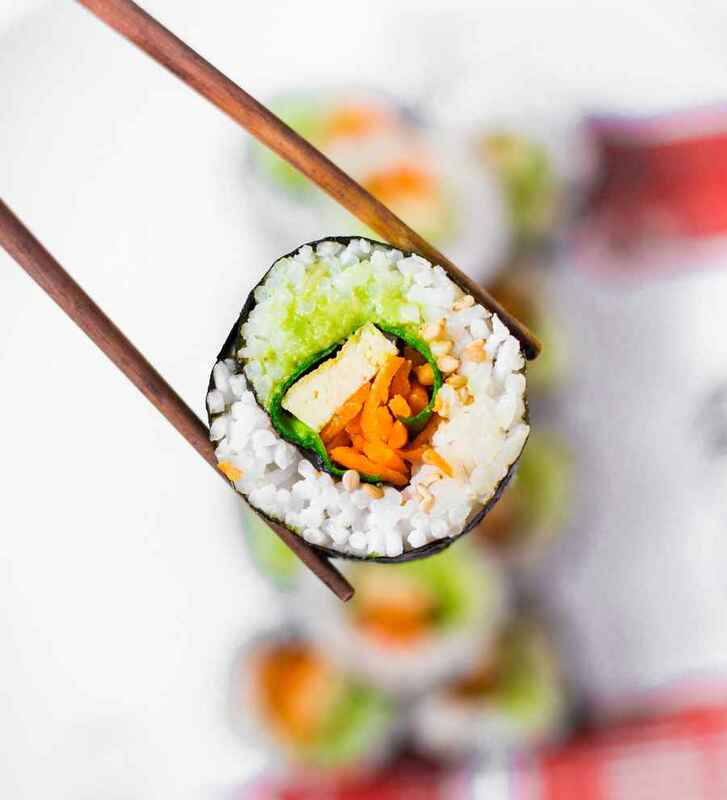 Use your fingers to push the veggies into the roll and continue rolling, applying light pressure to make sure the roll is tight. Place the rolls in a plate and refrigerate for 10 minutes. This will make it easier to cut them. Wet a sharp knife with water so it doesn't stick to the nori and rice. You should be able to slice each roll into 8 pieces. Dip your knife in water before each slice. 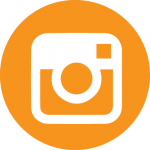 I store leftover sushi rolls in the fridge in an airtight container for up to 3 days.